I've been obsessed with comedy my entire life. I've performed improv for close to ten years, written hundreds of silly sketches and blog posts, and even my own one man show with four ridiculous characters. But funny enough (you know, funny "hmm-hmm"), I've never considered doing stand-up, the final piece of the "comedy trifecta." Instead I decided to go in the less comedic direction of live storytelling. And until recently, I've never really give it all that much thought as to why I jumped at the chance to do one and have perpetually avoided the other. But the more I think about, the more I realize it actually makes perfect sense. 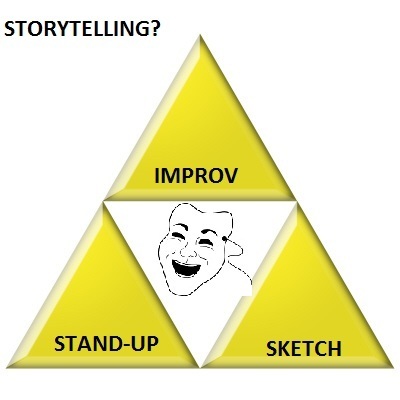 I've yet to attain the Triforce of Stand-Up. For one thing, I'm terrible at telling jokes. I have two stock jokes that I tell when pressed (I know you're wondering: "when the hell is one pressed to tell a joke?" and the answer to that is: 1) when you're in an improv scene and your character is a stand-up comic or someone who say, likes telling jokes at the office and/or 2) when someone confuses improv and stand-up and asks you to tell them one of your jokes, and you're too lazy to correct them, so you just roll with it). One of them is a knock knock joke - "Orange you glad I didn't say banana?" - and the other is a racist one I won't tell here, but suffice it to say it involves an Asian man urinating in some poor fellow's soda. I can't even properly re-tell a joke I've recently heard a professional stand-up comic tell. It's like my brain isn't wired right for the typical "setup / punchline" style of speaking. It's quite unfortunate. But on the flip side I really get into telling stories. Mostly funny stories, or else, stories that have at least some levity to them. So ghost stories, for example, are out (something I'm also terrible at), as are stories about human atrocities, which thankfully I've yet to experience first hand. But that's really the only limitation. I love getting wrapped up in a big narrative with tons of great details and stupid tangents. Actually, this blog is a pretty good example of the type of content I like to produce. I've written a lot of stuff that's straight up silly, like the Poker with Jokers post from a month ago. But I'm generally just as happy to write about my addiction to video games, things that make me cry, and my inspired moment of seeing my life as Rubik's Cube. While just about everything I write and perform has some kind of humorous slant (take that away from me, and I'm in serious trouble), I'd like to think I'm able to sometimes hit on a larger theme, and not just creating something funny enough to get a laugh. I've discovered that there is something of a blurred line between stand-up and storytelling that several comedians seem to easily step in between. Besides David Sedaris, whose writing I've been doing my best to imitate for years, there are two celebrities that come to mind that have inspired me, and I think have done stand-up in the guise of storytelling for years. Mike Birbiglia is one of them. I've seen him do five and ten minute sets that comes off essentially as a stand up routine with one long though-line. Audiences are laughing throughout, so it feels no less satisfying than a regular stand-up routine. But he's definitely not telling isolated jokes - it's more like a two minute story with eight minutes of tangential material, all of it very endearing, especially when he tells the audience during the more embarrassing moments: "I know, I'm in the future also." Michael Ian Black is the other stand-up slash storyteller. I've heard his stand-up routine in the past, and his older material is pretty straightforward setup - punchline routine. But in the past few years he's make several appearances on storytelling podcasts like RISK! and This American Life. When I saw him do a set a few weeks ago, all ten minutes were devoted to a story about being a father, with admittedly few true heartwarming moments (he openly admitted wanting to punt his baby and violently shake his child). But everything came from a truthful place, and ultimately it was an equally funny and endearing set. So maybe comedic storytelling is just an alternative version of stand-up comedy. Also, I've noticed the word "endearing" keeps popping up in my descriptions, and now I'm thinking maybe what I really want (and what doing stand-up alone simply can't provide) is for everyone to both love me and think I'm the funniest person alive when I write or get up on stage.